Today, as well as being Memorial Day, was my Make Your Photos POP! Workshop. It went well. We covered everything I set out to cover and had a good time. This entry was posted in Beckwith Mansion & Estate, New York, Palmyra, New York and tagged 2010, Adobe, Adobe Photoshop, Beckwith Mansion, Brent, Brent Walton, db walton, Estate, Monday, New York, Palmyra, photographs, photography, Spring, workshop on May 31, 2010 by dbwaltonm. We had a long choir practice today as we are getting ready for Hill Cumorah Pageant. Traditionally, on the two Sundays that surround pageant, the choir sings several pieces about the Restoration. We also get a larger than normal turnout for choir. It was my turn to be organist. Sister Ward got up to lead the opening song, and stood there. I’m not sure if she was waiting for me to start, but I was wating for the starting beat. She looked at me as if to say, “Are you ready?” I gave her a nod, “Yes.” And, the congregation laughed. It was cute. This entry was posted in Beckwith Mansion & Estate, Latter-day Saints, New York, Pageant 2010, Palmyra, New York and tagged 2010, Beckwith Mansion, Book of Mormon, Brent, Brent Walton, db walton, Elizabethe, Estate, Hill Cumorah, Joseph Smith, Latter-day Saints, LDS, Missionaries, Mormon, New York, Palmyra, photographs, photography, Spring, Sunday on May 30, 2010 by dbwaltonm. Another day of record setting heat. At least, it is cooling off in the evening. This is unusual for this time of year. I’ve been fighting muscle spasms in my back. It’s like someone holding a remote switch and when they push the button, it inflicts pain. The problem is, you never know when they are going to push the button. 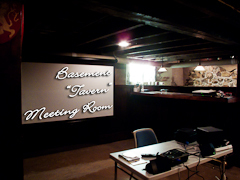 We got the tavern room all cleaned up and set up for Monday’s workshop. It sure is a cool room for workshops. This entry was posted in Beckwith Mansion & Estate, New York, Palmyra, New York and tagged 2010, Beckwith Mansion, Brent, Brent Walton, db walton, New York, Palmyra, photographs, photography, Spring on May 29, 2010 by dbwaltonm. It’s the start of a three-day weekend. I’m taking it nice and easy tonight as tomorrow is a busy day getting ready for Monday’s Workshop. This entry was posted in Beckwith Mansion & Estate, New York, Palmyra, New York and tagged 2010, Beckwith Mansion, Brent, Brent Walton, db walton, Elizabethe, New York, Palmyra, photographs, photography, Spring on May 28, 2010 by dbwaltonm. Sariah today turned 29. She’s the second oldest of my daughters. Happy Birthday Sariah. Post-weddings are a busy period. I spend a lot of hours sorting images, uploading them, color correcting them. But, once that’s done, the fun begins. I’m still waiting for the fun to begin. I’ve been invited to speak at the Southern Tier Professional Photographers in September. They have asked me to do my Art of Self-Assignment presentation. This is exciting. Very exciting. This entry was posted in Beckwith Mansion & Estate, New York, Palmyra, New York and tagged 2010, art, Brent, Brent Walton, New York, Palmyra, photographs, photography, Sariah, Self-assignment, Southern Tier Professional Photographers, Spring, STPP on May 27, 2010 by dbwaltonm. We had a barbershop practice tonight. We’re getting ready for summer so we can sing at picnics and other gatherings. We’ve got a few down quite well. I looked on-line for window air conditioner units. I need one for the office. It is too warm in there with all of the computers running. Hmmm… why can’t they create a computer uses the energy given off by the CPU and components to cool your office too? After all… Heat = energy. This entry was posted in Beckwith Mansion & Estate, New York, Palmyra, New York and tagged 2010, Beckwith Mansion, Brent, Brent Walton, New York, Palmyra, photographs, photography, Spring, Summer on May 26, 2010 by dbwaltonm. It seems like it should August, not May. I never checked the temperature, but it was definitely mid-summer weather. It was a good thing I worked in the temple tonight. The air conditioning there was nice and comfortable. Our unusual spring heat spell has come too early to be prepared for it. I would have thought that this would have caused the temple to be busier than normal, but we actually had a light night. This entry was posted in Beckwith Mansion & Estate, Latter-day Saints, New York, Palmyra, New York and tagged 2010, Beckwith Mansion, Brent, Brent Walton, db walton, Elizabethe, Estate, Latter-day Saints, LDS, Mormon, New York, Palmyra, photographs, photography, Spring, Temple, Tuesday on May 25, 2010 by dbwaltonm. Work was spent clearing out hundreds of e-mails from my mailbox. It was crazy. You just can’t select them and hit delete because inevitably, there is an e-mail that asks you to do something, or contains information that you must know. This entry was posted in Beckwith Mansion & Estate, New York, Palmyra, New York, Rochester and tagged 2010, Brent, Brent Walton, db walton, Elizabethe, Estate, Monday, New York, Palmyra, photographs, photography, Spring on May 24, 2010 by dbwaltonm. Well, I made it back from Utah. I was so tired I slept most of the trip from SLC to JFK. It only seemed like we were in the air for about 30 minutes. I was out before the fasten seatbelt sign went out, and woke when they announced we would be landing shortly. We spent the evening in at a lovely fireside for the workers in the Palmyra Temple. The chapel was full and it was a very spiritual evening as we were addressed by President and Sister Sherwood, and Elder and Sister Sybrowsky. This entry was posted in Beckwith Mansion & Estate, Latter-day Saints, New York, Palmyra, New York and tagged 2010, Beckwith Mansion, Brent, Brent Walton, Church, db walton, Elizabethe, Latter-day Saints, LDS, Missionaries, Mormon, New York, Palmyra, photographs, photography, Spring, Sunday, Temple on May 23, 2010 by dbwaltonm. I got a good eight-hours of sleep. John and I spent until about 10:45 am copying the memory cards to hard-disk from the wedding. There was about 10.5 GB of data, not to mention the data from the bridal shoot. We then met the girls for a few pictures, and then Amber, Brianna and I took John to the airport. On the way back to Utah Valley, we took a nice drive around the Draper Temple. It’s a beautiful beacon on the side of the mountain and is quite visible from I-15 on the way south. I was amazed at the number of abandoned multi-million dollar homes on the bench up there. It is sad to see the results of the economy. Utah is just coming in to what California experienced starting about 3 years ago. I know there are some Utahan’s in denial, but I think Utah is about to feel what California has felt for the last 3 years. We met up with Rebecca, Mike and Chris for dinner at Sonic. We took some more pictures, and then I took Amber back to her car and wished them goodbye. I now sit at SLC waiting for my flight to JFK. My rear is already sore from sitting, so I better walk before I board my flight. This entry was posted in Latter-day Saints and tagged 2010, Brent, Brent Walton, db walton, Latter-day Saints, LDS, photographs, photography, Spring, Temple on May 22, 2010 by dbwaltonm.